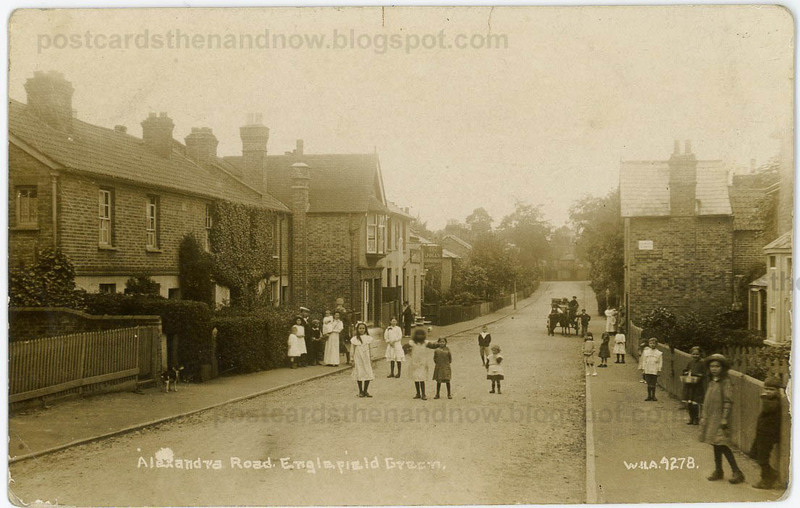 Englefield Green, Surrey, Alexandra Road circa 1914. The buildings on the left appear to have survived relatively intact, though the prominent shop on the right hand side of the road advertising 'Colmans Starch' has gone. The children playing in the road have also gone, replaced by parked cars. You can see the sign for The Jolly Sandboy pub (probably just a beer house). The building still stands, but is now a private house. The house has a blue sign on its wall saying 'The Jolly Sandboy'. Postcard by W. H. Applebee, click to enlarge. My favourite kind of scene with lots of people, especially curious children and a dog. Wonderful Post and how did you find this old Picture?? ?